MINNEAPOLIS — When Monika Czinano was just a little girl, there were plenty of influences on her by her family. 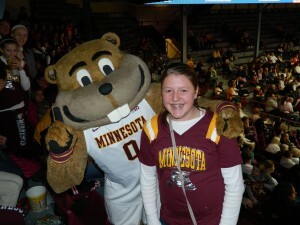 Living in Minnesota, Czinano was a big Gophers fan, and would often have her birthday parties at Williams Arena. 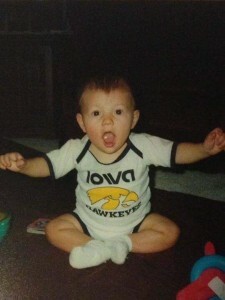 Her grandfather, an Iowa Hawkeyes fan who passed away when she was young, did all he could to nudge her the other way. Flash forward to Monday night, and the story comes full circle. In front of her family, friends, former teammates, and friends at Watertown-Mayer High School, Czinano returned home with a little bit of that influence on each side. She was back at Williams Arena once again, but this time, in an Iowa Hawkeyes jersey. 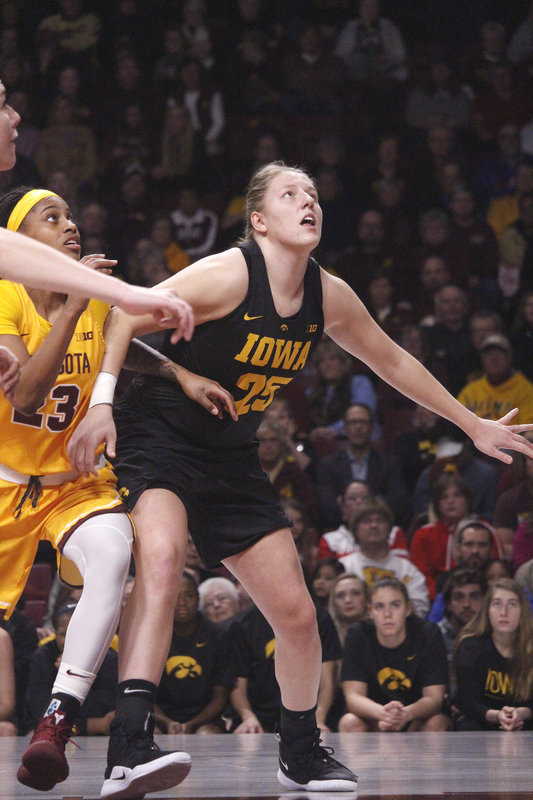 Monika Czinano battles for rebounding position in Iowa’s matchup with the Minnesota Gophers Monday night. It was Czinano’s first trip back home with the Iowa Hawkeyes. Czinano, a freshman on the Iowa women’s basketball team, was making her first trip back home. While it was a bit of a weird feeling at first coming home, it’s a moment and memory she’ll remember forever. Czinano played just four minutes in Iowa’s 81-63 victory over the Gophers. Although most people knew Czinano’s playing time would be limited, that didn’t stop them from coming out in full force. More than 65 people made the trip to Williams Arena to support Czinano in her first game back in her collegiate career. Whether it was family, her former teammates at W-M, youth basketball players who look up to her, or kids from the W-M Unified Sports in which Czinano was so active during her time W-M, the loudest cheers of the night came for No. 25. While Czinano was busy taking care of business during the game, her friends and family who made the trip were soaking it all in. Coming from a small town, the town of Watertown has rallied around Czinano, claiming her as one of their own. A birthday party at Williams Arena was the perfect place for Czinano. Of course, tha had to include a picture with Goldy. When Czinano decided to attend Iowa to continue her basketball career, she knew there was a highly-touted player by the name of Megan Gustafson already there. Both Czinano and Gustafson play a similar position, and instead of choosing to play somewhere else, Czinano saw an opportunity. While Czinano was used to playing 30 to 34 minutes a game in high school, she’s lucky to see the floor for 10 minutes or so in her freshman season. While that can be tough to deal with after being a Miss Minnesota Basketball finalist, Czinano has accepted her role this season for the Hawkeyes. One would think that Czinano has had a love for the game since an early age, but that’s not the case. She wanted to quit basketball entirely when she was in fourth grade, and endured even more later on her in life with injuries to get where she is now. Even when Monika Czinano was little, it’s always been about Iowa and Minnesota. Her grandfather was a huge Iowa Hawkeyes fan, while Czinano would often have her birthday parties at Williams Arena for Gopher basketball game. When Czinano returned home Monday night as part of the Iowa Women’s basketball team, the two collided once again as Czinano returned home to play against the Gophers for the first time in her collegiate career. While Czinano might not see the floor this season as much as she wishes, she knows the opportunity that is in front of her. She has a whole season to learn from one of the best players in the Big 10 – if not the country. When it comes to records at Iowa for the women’s basketball program, Gustafson is the only name that comes to mind. An All-American, the Big 10 Player of The Year last season, and the player who holds nearly every single record for Iowa is what Czinano has the chance to learn from. Gustafson was the only player in the country last season to average more than 25 points per game, and shoot better than 67 percent from the field. Gustafson will go down as one of the best players of all time at Iowa, and Czinano is soaking up and learning as much as she can along the way from her. Getting to go up against Gustafson every day in practice only bodes well for Czinano. While it’s been an adjustment, she’s hoping this year prepares her for the years to come, when it’s her turn to dominate in the paint for the Hawkeyes.